I admire Urban Outfitters. They create Unique, Relevant, Memorable Retail Experiences and routinely engage in Retail Innovation -- all based on knowing their customers. 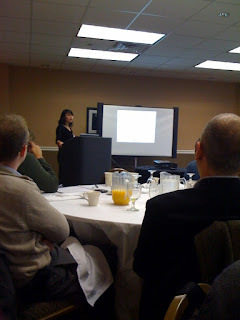 That knowledge of customers extends to their use of new, social and digital tools and how the organization integrates them with other marketing channels, as I learned on 1/12/10 at the Social Media Club on New Jersey meeting when Theresa Lee, director of marketing for Urban Outfitters, discussed Dynamic Retail: Urban Outfitters. Urban Outfitters, you see, is actively engaged with social media marketing tools. Why? Because that's where their customers are. It's no different from their other marketing channels, says Lee. What does matter is that Urban Outfitters be present, speaking in an authentic voice that is appropriate to Urban Outfitters, sharing content relevant to its customers. The results: a Facebook Fan page with close to 150k fans [as of 1/26/10], an @urbanoutfitters Twitter account with 63K followers, a visually vibrant blog, and flickr photostream - all with plenty of engagement. 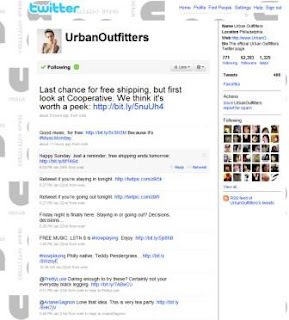 You'll notice that the content Urban Outfitters shares via its social media channels is in keeping with the retailer's uniqueness: lifestyle, fashion, style, art, music, occasionally some outside content... On Twitter, you'll see humorous product callouts and free content coinciding with #musicmondays. Most recently, UO had someone blogging & tweeting from CES. None of the interaction is about selling - which is in keeping with the overall Urban Outfitters' philosophy of creating so much engagement via its store and online experiences that shoppers sell themselves. + In Winter of 2008, the company became involved with Facebook. + In Spring of 2008, it launched Flickr and Ratings & Reviews. + In Spring of 2009, it launched a Twitter presence and Ask & Answer. Ratings & Reviews come with guidelines and they are moderated for relevance. What struck me during Theresa's presentation was the the common sense, practical approach that UO takes not only for its digital and social interactions, but also in integrating social into its overall marketing. It's about consistency and authenticity across channels and piggy-backing off of existing events taking place [e.g., #musicmondays on Twitter]. Customers who engage on Facebook and Twitter are passionate ones and UO will do special things for them. Given how inexpensive the channels are, it's easy to experiment. Urban Outfitters has one person whose job it is to accept/reject reviews. She leverages all channels, ensuring that each is populated with content and ensuring that everyone's involved depending on feedback received. I love this statement from Theresa: customers aren't siloed and you can't operate that way either. + Don't think you ever had total control of your brand. Rather, you just weren't having brand perceptions. + Not all customer reactions are positive. But, they never were to begin with. Now you can hear them. + Be self skeptical: experiment and learn. By the way, Jen Mediano has a terrific overview of the event in Urban Outfitters On Social Media: 'Don't Commission An Agency To Figure This Stuff Out'. And, from the event organizer, Michael Menche: Fa-fa-fa-fa Facebook with Urban Outfitters. What tools do you use to be where your customers are? And, what have you learned from your customers? Thanks for the digest of Ms. Lee's presentation. I'm a big fan of the UO family's marketing think, nice to hear some background. I'll check in with your blog again. SF, I do love how focused UO is on its business. It sure makes these type presentations that much more valuable & informative. I know someone who would love this article about UO. He just adores the store. Tara, thanks for sharing this post. I bet your friend will have valuable insights to share about UO. I like how UO exhibits personality, especially humor via their tweets. A good example of a B2C that is utilizing social media as a tool. Jim, I find UO to be a wonderful example from so many perspectives and love that they also use social media effectively. Thanks for commenting.